Map showing the position of the province in Tuscany. The Province of Grosseto completely occupies the southern end of Tuscany, and with a territorial area of 4,504 square kilometres (1,739 sq mi), it is the most extensive in the region and one of the least dense in population in Italy. 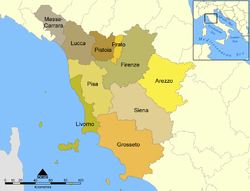 The province is bordered to the northwest by the Province of Livorno, to the north by the Province of Pisa, to the northeast by the Province of Siena, and to the southeast by the Province of Viterbo in Lazio. To the south is the Tyrrhenian Sea, which includes the southern islands of the Tuscan archipelago, including Isola del Giglio and the smaller Giannutri islands and Formiche di Grosseto and Formica di Burano. The Arcipelago Toscano National Park spans both the provinces of Grosseto and Livorno, and includes the seven main islands of the Tuscan Archipelago: Elba, Isola del Giglio, Capraia, Montecristo, Pianosa, Giannutri, Gorgona, and some of the minor islands and rock outcrops. The highest point in the park is Mount Capanne, at 1,019 metres (3,343 ft) in elevation, on the island of Elba. The Colline Metallifere (Metalliferous Hills) line the border in the south with Lazio, and contain the Natural Park of Maremma, that protects also some of the remainings of the large swamps that once covered the area. Other protected areas are the Diaccia Botrona marshland. The principal rivers are the Ombrone, Fiora, Albegna, Pecora, Bruna, Merse, Lente, Farma and Chiarone. The coastline between the Gulf of Follonica and the mouth of the Chiarone is dominated by blue waters and pine forests, and is home to resorts such as Marina di Grosseto, Principina a Mare, Castiglione della Pescaia, Punta Ala, Puntone di Scarlino and Talamone. Lakes include Lago dell'Accesa, Lago di Burano, Lago di San Floriano and Lago Acquato. Also of note is the volcanic cone of Mount Amiata, Bandite di Scarlino (213 m), Promontorio di Punta Ala e delle Rocchette (350 m), Monti dell'Uccellina (417 m), Monte Argentario (635 m), and Promontorio di Ansedonia (113 m). ^ "Statistiche demografiche". Istituto Nazionale di Statistica. Retrieved 30 September 2014. ^ Hogg, Sylvie (9 February 2011). Frommer's Italian Islands. John Wiley & Sons. p. 134. ISBN 978-1-118-03347-0. ^ "Parco Nazionale Arcipelago Toscano". Parks.it. Retrieved 30 September 2014. ^ Facaros, Dana; Pauls, Michael (2007). Tuscany, Umbria and the Marches. New Holland Publishers. p. 307. ISBN 978-1-86011-359-8. ^ "Benvenuto in Joomla". Parco-maremma.it. Retrieved 29 September 2014. ^ Bowsky, William M. (1 January 1981). A Medieval Italian Commune: Siena Under the Nine, 1287-1355. University of California Press. p. 6. ISBN 978-0-520-04256-8. ^ "Grosseto". Italia.it. Retrieved 30 September 2014. ^ "Statistiche". Upinet.it. Archived from the original on 7 August 2007. Retrieved 29 September 2014.